This is a simple walkthrough aimed primarily at newer Linux users on how to use the abif installer, demonstrated here via ArchLabs Linux. This tutorial assumes you’ve successfully downloaded the ArchLabs Linux .iso and installed it (Unetbootin and Rufus provide a GUI to do this step on Linux and Windows, respectively) to the medium of your choice and have an active internet connection available. Select your language, and press enter to proceed. After you’ve read the instructions and progressed to the next screen, you’ll be greeted by a main menu. You’ll need to complete the required steps prior to successfully installing ArchLabs. Press Enter with ‘Prepare System’ highlighted to begin configuring settings used by the system during installation. You’ll need to select your keyboard layout two successive times for non-graphical logins and desktop use, by moving the highlight to the appropriate keymap and hitting enter. If you do not know which keymap to use, please see this list and match your country of residence to the ‘Alpha-2’ column (i.e., ‘us’ for the United States). This step is largely self explanatory, it lists the disks and partitions on your system detected by the installer. The partitioning step must be done with great care if you are installing alongside another operating system. If you have a disk dedicated to Linux, simply select the automatic partitioning option (take care to install to the hard disk and not any USB drive you may be using). If you are new to partitioning, you should use the user friendly ‘gparted’ utility(exit the installer, press WIN+t, and type ‘gparted’ into the terminal). Though gparted can safely resize Windows partitions, you should ALWAYS back up all of your data prior to altering a disks’ partition table as there is always some risk of data loss. To resize a partition, simply right click the partition and select resize/move. Once you’ve allocated disk space for ArchLabs, you’re ready for the installer’s next steps. LUKS provides an extra layer of security via disk encryption, which will necessitate entering an additional password before you can access your install. Select the Automatic setup option if you would like to encrypt your device. During the installation it will prompt you to choose a location to store a mandatory unencrypted boot sector(unless you’re using LVM). Logical volume management allows for easily adding,resizing, and reallocating disk space. It largely won’t have any impact on your day to day usage and is outside the scope of the tutorial (check out this tutorial for an introduction). Choose the partition created earlier to install ArchLabs to. Create an ext4 filesystem, and on the following screen optionally select ‘noatime’(this will prevent the update of file access time, which reduces disk load) and press the spacebar to select it prior to progressing the installer. After you confirm any disk options you chose, create a swap file roughly equivalent in size to your RAM. Depending on your hardware, this can take awhile. 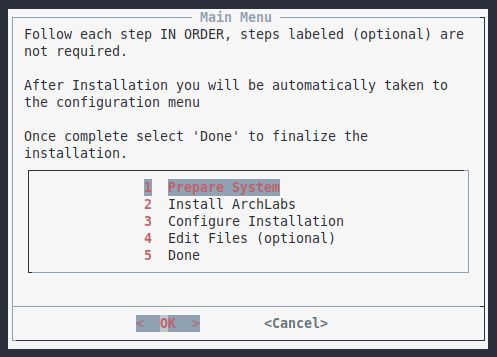 This is the last step to installing Archlabs Linux on your computer via the abif installer. If you encounter issues, ask a question on the Archlabs forums or their freenode IRC room at #archlabslinux.